Please see below examples of frequently asked questions relating to the Flood Defence Scheme along with their answers. Q1. Can dredging on its own solve the flooding in Enniscorthy? A1. No. The Slaney is tidal to Enniscorthy Bridge, dredging in tidal waters is not effective in reducing peak flood levels because the dredged area becomes occupied by tidal waters and is not available to take flood flows. Q2. Can Seamus Rafter Bridge be retained? A2. No. Seamus Rafter Bridge needs to be removed to reduce flood levels and improve conveyance of flood waters from the town. Q3. Can a higher bridge be located where Seamus Rafter Bridge is currently located. A3. No. If a bridge was located here, the road level of the bridge would have to be raised by over 4.5m. The approach roads (Shannon Quay, Abbey Quay, Wexford Road) would also have to be raised by a similar amount. This would prevent access to existing properties along the quays and would have a significant negative impact on the visual amenity of the town. Q4. Will access for fishing be maintained? A4. Yes, access will be provided so fishing can take place in the river. Q5. Will the new pedestrian bridge and road bridge be in place before Seamus Rafter Bridge is removed? Q6. What will the new road bridge look like. Q7. Can Abbey Quay and/or Shannon Quay be raised to reduce apparent wall heights? A7. The scope to raise these roads is limited by the presence of existing buildings and thresholds along the streets. Raising the road could give rise to a surface water flood risk and access issues at these properties. Q8. Can the Wexford Road be raised to reduce the apparent height of the walls there? A8. It is proposed to raise a section of the Wexford Road. 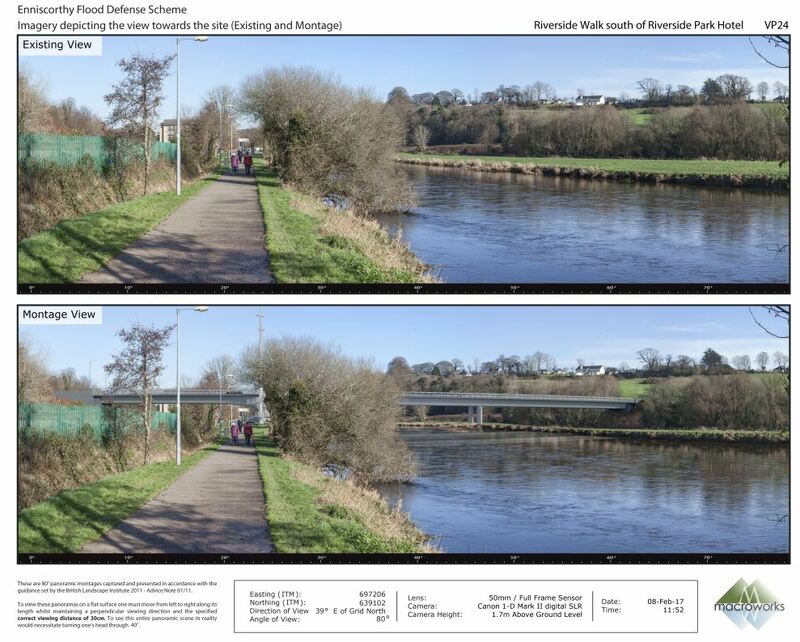 Details of the proposed works will be shown at a public display in Enniscorthy before the detailed design is finalised. Q9. How will traffic be affected by the scheme? Q10. 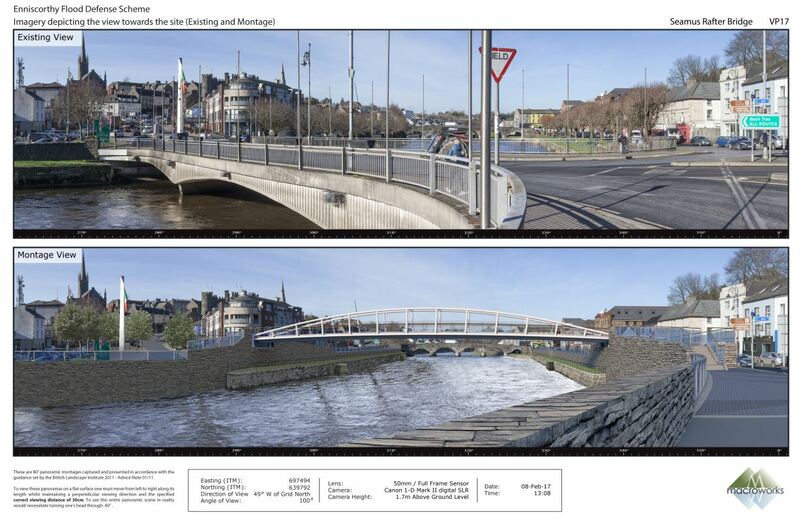 Can two-way traffic be allowed across the Old Enniscorthy Bridge when the scheme is completed? A10. It is proposed to allow two way traffic on this bridge following the completion of the scheme. Q11. Will the car park and playground to the south of the town be protected from flooding under the scheme. A11. No. The aim of the scheme is to manage flood risk in residential and commercial properties. Q12. What will the flood defence walls look like? A12. Photomontages of the proposed scheme can be seen by following this link. Q13. Will the dry arch of the Old Enniscorthy Bridge be blocked? A13. No this will remain open and accessible from the north and the south..
Q14. Will the presence of flood defences increase the levels of extreme floods. A14. No. The scheme includes the dredging of the river, the widening of the river, the provision of a compound channel and the removal of Seamus Rafter Bridge. The overall impact of all of these works is to reduce extreme flood levels upstream of the town and to have no change in flood levels downstream of the town. Q15. How much will the scheme cost? A15. It is estimated that the scheme will cost between €40 and €45 million. Q16. How long will the works take? A16. It is estimated that the construction works will take three years to complete. Q17. How will flood water be prevented from flowing back up existing drains? A17. Non-return valves will be placed on outlets to the River. This will prevent flood water from flowing back up the pipes. Pumping stations will be installed in the quays so that surface water that falls behind the defences during a high river level event can be pumped into the Slaney. Q18. Will a flood warning system be put in place for Enniscorthy? A18. No. It is likely that the flood alleviation works would be complete in the time necessary to “bed in” a flood forecasting system to the extent that it would be able to give sufficient warning times with an acceptable degree of reliability. Q19. Will access ladders and safety buoys be provided? A19. Yes. The safety of the scheme will be assessed during the design. Q20. Who will maintain the glass wall panels? Are they safe? A20. Wexford County Council will maintain the glass walls. These types of walls are proven to be strong enough to withstand the relevant loadings from flood water and flood debris. Q21. Will the existing slipway be replaced following the river widening? A21. Yes. It will be re-located in the car park on the Promenade. Q22. Under what powers will the works be carried out? A22. The scheme is being carried out under the 1945 Arterial Drainage Act as amended in 1995. When the Minister Confirms the scheme the Office of Public Works will be able to have the scheme constructed. Wexford County Council are acting as agents of the Office of Public Works in the implementation of the scheme. Q23. Where will the new pedestrian bridge be located and what will it look like?